Linda was the one to notice this spider walking slowly across the trail we were hiking on the top of Mesa Verde, Colorado this week (sorry Rosie). We guessed it was a tarantula by the way it walked, with each leg being slowly and meticulously picked up and replaced, and by the way it reached up at me with its two front legs as I took its picture (thus out of focus in that picture). Checking on Colorado spiders makes me conclude that it was in fact a male tarantula. It is the end of the mating season for tarantulas, when the males are out searching for the scent of a female to mate before it dies. It may have taken ten years for it to have reached sexual maturity; it will mate once, and it is likely its mate will kill it. The experience made me think that I didn't report much on spiders around Lake Wicwas this past summer, though I did have some interesting encounters. One spider that is quite visible due to its size and tendency to build nests in conspicuous locations is the Black and Yellow Garden Spider. It builds a beautiful symmetrical web that can catch rather large insects; this one made its nest right on the side of the garage. I think it may be a "Long-jawed Orb Weaver" - this spider has the right appearance and they are reported to build their webs near water. 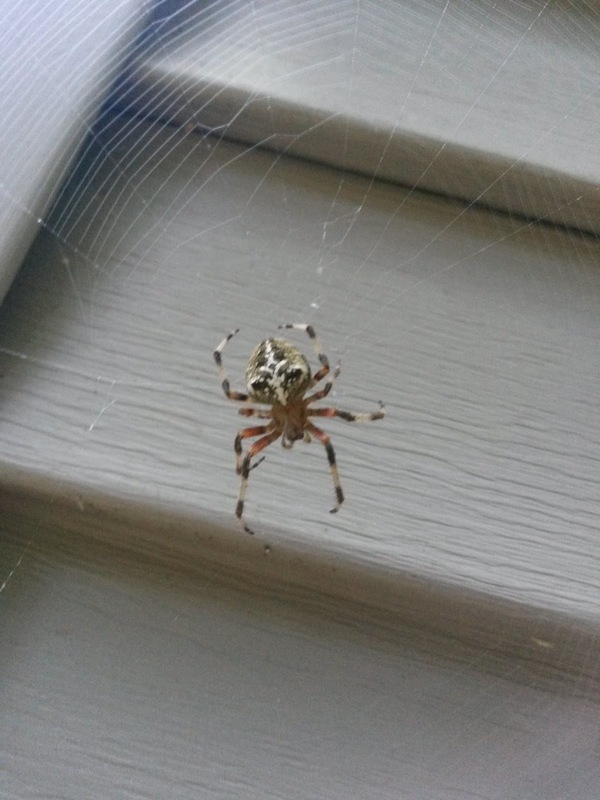 I've seen this spider frequently on boats and I've seen this web many times, but this is the first time I've seen the spider on the web so was able to connect the two. I think this guy needs to take architecture lessons from the garden spider. Other such cobwebs are built right down on the ground. Finally, here's one beautiful web that was glistening in the morning sun right on the trail I was walking. The tiny spider is visible on the lower left quadrant of the web. It looks like the spider had some customers over night, as the web has a few signs of battle damage. Fortunately, the light was such that I saw it before it was totally demolished by becoming an adornment for my face! No matter how may spiders we might run into in New Hampshire, at least we don't have to worry about encountering a tarantula!